So this probably should've been posted a couple of weeks ago but alas I'm just getting to it now. Although I didn't get to eat a cheeseburger while in Charleston, SC I did get to sample lots of other delicious food which I wanted to document. Ryan and I were in town for my friend Liz's wedding on Sunday May 29th. It was a gorgeous event and I felt so honored to share her special day with her. Since my parents had driven to Charlotte to watch the boys for us, Ryan and I decided to spend an extra night in Charleston to have a mini-vacation. On Monday morning we packed up our things in our hotel and headed out to breakfast. We had been staying in Mount Pleasant and found the cutest coffee shop to dine at. Not only was the coffee at The Collective divine, their food options hit the spot. I ordered the Pimiento Cheese biscuit, with brown sugar bacon, egg, and cheese. YUM! After breakfast we headed to Sullivan's Island to hit up the beach. It definitely started drizzling on us but I wanted a chance to walk along the water since we rarely see the beach. We spent about 1.5 hours walking along the beach collecting seashells, before we decided to head over the bridge to Charleston. Our hotel room wasn't ready yet so we changed into running clothes in their bathrooms and headed out for a jog/walk around the city. 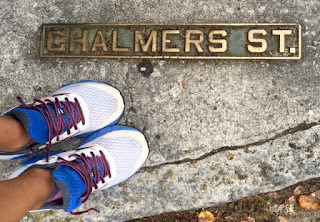 We love that there is a street in downtown Charleston named Chalmers Street and always try to take a photograph while we are there. We managed to run 3.5 miles before heading back to our hotel. We were disappointed that our room still wasn't ready, but that didn't stop us from heading to lunch in our sweaty workout clothes. We sat at the bar at Amen Street Fish & Raw Bar and had a couple of beers and fresh seafood. No pictures were taken but we did enjoy our food (I ordered the ceviche). After lunch we managed to check-in to our hotel and quickly showered and got ready to head back out to happy hour. Hitting up the happy hour at Pearlz Oyster Bar has become our tradition and we didn't want to miss the 4pm start time. We polished off 2 dozen raw oysters! I also ordered corn fritters and pork rinds. Among all of the draft beer we drank, we also took 2 oyster shooters. Now we were ready to party! The rain was off and on so we headed to another bar to avoid getting soaked. We found Craftsmen Kitchen & Tap House and settled in at the bar. I ordered a beer flight and their fried pickles off the happy hour menu. Clearly by this point Ryan and I had been eating and drinking most of the day. That didn't stop us from continuing our mini pub crawl through Charleston! Our next stop was Cypress for some wine and a cheese board. We sat the bar upstairs and felt pretty swanky in the fancy restaurant. We then headed to High Cotton for a more relaxed vibe and some live music. Plus I heard their espresso martini was to die for. And it was. Super tasty and way decadent. As you can probably guess I was pretty drunk at this point and demanded dessert. We ended our night at Carmella's Dessert Bar where I proceeded to order everything in their dessert case. No lie. So there you have it. A little bit of running and a whole lot of eating in one of my favorite cities in the world. Check out any of the places I mentioned for some tasty treats.